Synopsis: Several years after the tragic death of their little girl, a dollmaker and his wife welcome a nun and several girls from a shuttered orphanage into their home, soon becoming the target of the dollmaker’s possessed creation, Annabelle. The biggest hurdle facing Annabelle: Creation is the fact that, at first glance, it seems to be an unnecessary movie; the first act of Annabelle already covered the origin of the demonic doll. Or so we thought. As it turns out, that was only half of the story. Annabelle: Creation goes back a little further in time to bring fans the other half. 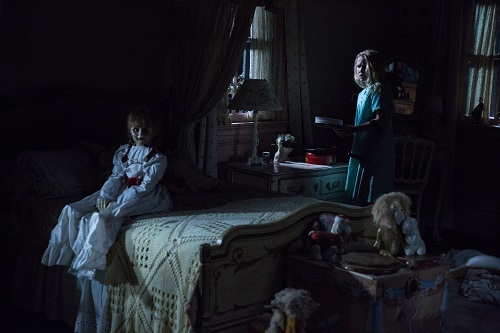 Set about 12 years before the events of its predecessor, Annabelle: Creation is about a dollmaker named Samuel Mullens (Anthony LaPaglia from Big Stone Gap) who, following the untimely death of his young daughter, opens up the home he shares with his invalid wife, Esther (Miranda Otto from What Lies Beneath and The Homesman), to a group of orphaned girls and their nun caretaker, Sister Charlotte (Spectre‘s Stephanie Sigman). As the children explore the house and grounds, a polio-stricken girl named Janice (The 5th Wave‘s Talitha Bateman) stumbles upon The Mullens’ daughter’s old room, which still contains all her old clothes and toys – and the infamous handmade Annabelle doll. Unfortunately, the room also contains a presence that Janice’s sister, Linda (Lulu Wilson from Ouija: Origin of Evil and Deliver Us from Evil), believes is the ghost of the dead girl. Soon enough, it becomes clear that whatever entity is in the room is very powerful – and it has attached itself to Janice. Annabelle: Creation was directed by David F. Sandberg (Lights Out) from a screenplay by Gary Dauberman (who also wrote the first Annabelle), and it’s exactly the movie that one would expect it to be – it’s the director of Lights Out making a movie that fits into James Wan’s The Conjuring universe, the cinematic world off of which Annabelle was spun. Sandberg’s direction is actually a good fit for the material, as he knows how to play with light in a way that both emphasizes and downplays the now-you-see-it-now-you-don’t style of Wan’s productions. Throw in the sweeping and swirling, selectively-showcasing camerawork of cinematographer Maxime Alexandre (Maniac, Earth to Echo), and you’ve got one hell of a suspenseful fright ride. There’s not much in Annabelle: Creation that horror fans (or even movie fans, for that matter) haven’t seen, but that doesn’t mean that it’s not a fun flick. It’s a well-made movie, one that showcases Sandberg’s talents as a horror filmmaker on a much grander scale than Lights Out did. It’s also a beautiful looking movie, dark and atmospheric, with a creepy visual aesthetic that makes it feel like both a modern horror movie and the period spook tale that it is. And it adds a lot to the overall mythology of the Annabelle doll without anything seeming forced – in fact, there’s a natural link to the other movie (and, therefore, to Wan’s entire The Conjuring universe) that is actually pretty brilliant. After two The Conjuring movies and the first Annabelle, people pretty much know if they’re going to like movies like this, and nothing in Annabelle: Creation is going to change anyone’s mind. For those who do like them, there are also movies about The Nun and The Crooked Man from The Conjuring 2 coming up on the docket in the not-too-distant future. Hell, James Wan can make a movie about every single artifact in the Warrens’ museum as long as the movies turn out as well as they have been. Annabelle: Creation isn’t as good as The Conjuring, but it’s better than Annabelle. So if the Wan-iverse is your thing, you’ll love it. James Wan-produced movies tend to have a certain slickly haunting tone, and Annabelle: Creation fits into that mold perfectly. Many of the scares are cheap volume-induced jump scares, but there are also some real nail-biters in there as well. The slowly swinging doors, the barely-visible demonic faces, the long periods of deafening silence, they’re all there. Of course, there’s the Annabelle doll herself, and all of the “did she just move her head?” and “was she smiling before?” that comes with her. There are also a few moments of brutality that the squeamish will no doubt catch themselves watching through their fingers. Annabelle: Creation pulls out all the stops and utilizes all of the standard spooky tropes, but they are effective, and there’s nothing wrong with that.